alaTest has collected and analyzed 39 reviews of Withings Activite Steel. The average rating for this product is 4.2/5, compared to an average rating of 4.2/5 for other products in the same category for all reviews. We analyzed user and expert ratings, product age and more factors. Compared to other products in the same category the Withings Activite Steel is awarded an overall alaScore™ of 90/100 = Excellent quality. If you want a fitness tracker that looks like a real watch and you don't need heart rate tracking, the Withings Activité Steel is the one to get. 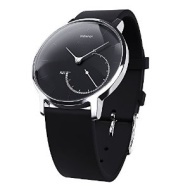 You can order the Withings Activité Steel now. The first 300 orders ship on November 17. After that you’ll have to wait another week until the 25th.